ISO (International Organization for Standardizatio) is an independent, non-governmental organization, responsible for the development and publication of non-electrical international standards. It announced ISO 9001 for a set of international quality management tools, to maintain the enterprise provide the quality of products and services. Taking「Quality」as the primary principles, TKS established quality management system in 2007. In order to emphasize our insistence on quality, we regard product and service quality assurance as the basic required. Continuously focus on enhancing the internal management standard and the quality management system. An enterprise certified by ISO 9001 will be able to execute significant reforms on organizational efficiency and product quality, minimizing waste and mistakes, thereby increasing productivity. TUV (Technical Inspection Association) is the research institution specifically testing safety of electronic product, including safety certification of product、quality certification、ROHS testing, etc. It is the most authoritative third Party Inspection and certification institute. 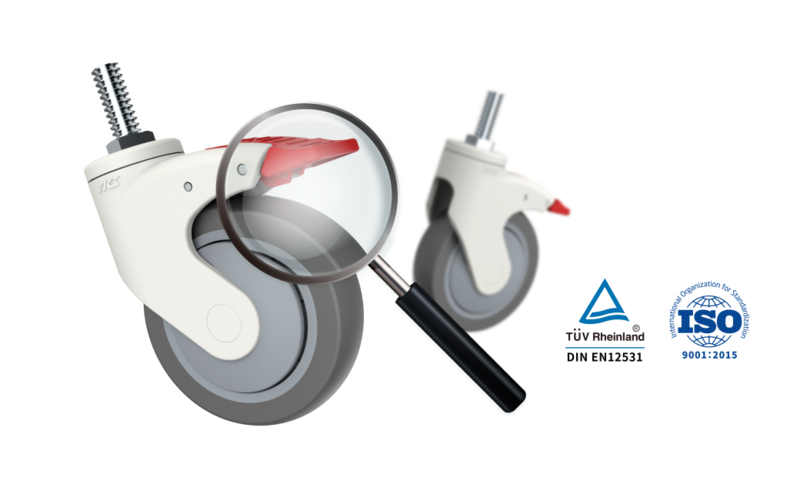 In order to provide customers with the highest quality medical casters, the application of our product all certified by IEC 60601-2-52&38. Besides, to meet the high requirement standard of medical casters, we passed the inspection certified by the TUV Rheinland in 2009, and obtained DIN EN 12531. This is not only recognition in our products, but also provides you with the highest quality assurance.